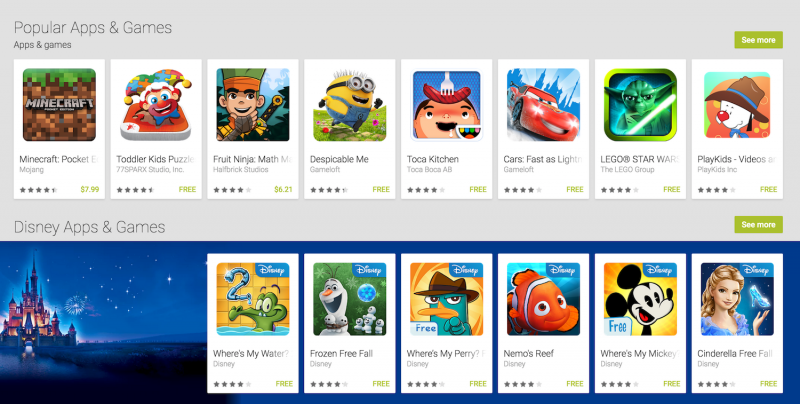 Last month at I/O, Google announced a new Family Friendly approach to Google Play including age specific ratings, a family appropriate designation, as well as a series of new highlighted sections. That is now rolling out on Google Play on the web and Android devices, with Family sections popping up in just about every category including apps, movies, TV shows, books and more. Inside of the Family Friendly apps and games section, Google has laid out some handy quick links for parents in the drop down menu. You’ll find everything from age based categories, as well as break-downs by genre, like action, adventure, arcade, card etc. In fact, there is an entire page with some editor selected titles, and apps categorized by popular children’s characters and franchises like Elmo, Dora the Explorer, Teenage Mutant Ninja turtles, Disney, LEGO and more. Much of the same applies to the Movies & TV and Books categories, where you’ll find a new star designation to indicate whether Google deems the content family friendly or not. Region specific ratings still apply throughout. There is also a new IAP protocol in place that requires a password to be used on any family friendly content, whether your account is setup for one or not. You should be seeing the new Family sections on your devices now, and be sure to head over to Google's support page for more detials.